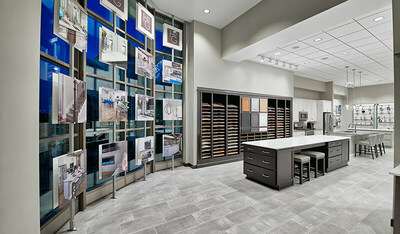 DENVER, Dec. 6, 2018 /PRNewswire/ -- Richmond American Homes of Colorado, Inc., a subsidiary of M.D.C. Holdings, Inc. (NYSE: MDC), is pleased to announce that its new HG2 design center was named a 2019 Silver Award recipient for Best Design Center in The Nationals, the National Association of Home Builders' "largest and most prestigious awards competition." Located in Denver, Colorado, HG2 was built to showcase the focused assortment of fixtures and finishes available in Richmond American's new Seasons™ Collection, which offers a versatile variety of features at an amazing price point. Boasting clean lines and a soothing, neutral color palette, the stunning 1,700-square foot showroom is located just a few doors down from the builder's original Home Gallery™ design center. Started in 1982 as the Institute of Residential Marketing, The Nationals award program continues to recognize superior new home sales and marketing achievements. "The Nationals are the most prestigious awards of their kind, setting the benchmark for innovations in new home design, marketing and sales," said Kelly Fink, chairperson of The Nationals. "NAHB's commitment to recognizing originality, imagination and success has been exemplified by its award winners since the competition's inception." Silver Award winners are the top vote recipients in each category and are finalists for the Gold Award. Gold Awards in each category will be presented as part of the International Builders' Show on February 19, 2019, at Caesars Palace in Las Vegas. The award ceremony is expected to draw more than 1,000 attendees. Visit http://www.thenationals.com to order tickets. A panel of seven industry professionals from across the country determined the Silver and Gold award winners from a field of nearly 1,300 entries during a three-day judging process. For more information about The Nationals, call 800-658-2751 or 909-987-2758 or email Lisa Parrish. To learn more about about HG2 or Richmond American's sought-after Seasons™ Collection homes, visit RichmondAmerican.com.